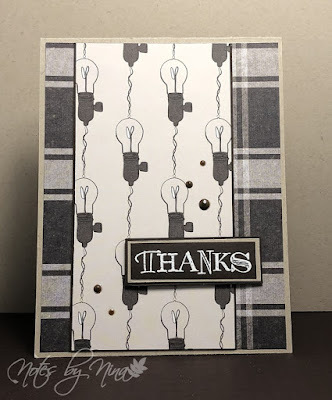 Notes By Nina: Lightbulb moment - Thanks. Is there anyone out there? I was having a discussion about blogs the other day and someone mentioned that social media like Instagram is the new blog. I have not posted much on Instagram but I do have an account, I will admit though these days I am lucky if I visit blogs never mind social media and somehow I feel guilty about that. Ahh well, I will still continue post as it has always been about my journey of card making. This card was very simple, I used a kraft card base, the DP is double sided so I made use of that. I added a layer of brown cardstock to the centre layer. The sentiment is heat embossed, layered and popped up with foam tape. Supplies: Kraft and brown cardstock, Designer Paper - Photoplay, Fiskars- Simple Stick. nuvo drops.